Nothing is as tempting and low and slow cooked meat. The flavors you can get with a good smoke are unlike anything else. And this leg of lamb proves just that! Combine the rub ingredients in a small bowl and rub liberally all over the leg of lamb, being sure to get in between the seams. Prep your smoker and wood chips for 210 - 225 degrees F.
Smoke the lamb for 8 - 10 hours, or until the lamb temperature is between 185 and 190 and the lamb slices easily. When safe to handle, shred the lamb. Arrange the shredded lamb in a foil baking pan, pour in the beer, cover with foil and steam over low heat until the fat and cooking liquid have combined and are reduced by half. 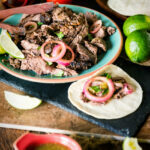 Serve with the salsa verde, homemade pickled red onions, lime wedges, avocado, and corn tortillas for a down home barbacoa bar.